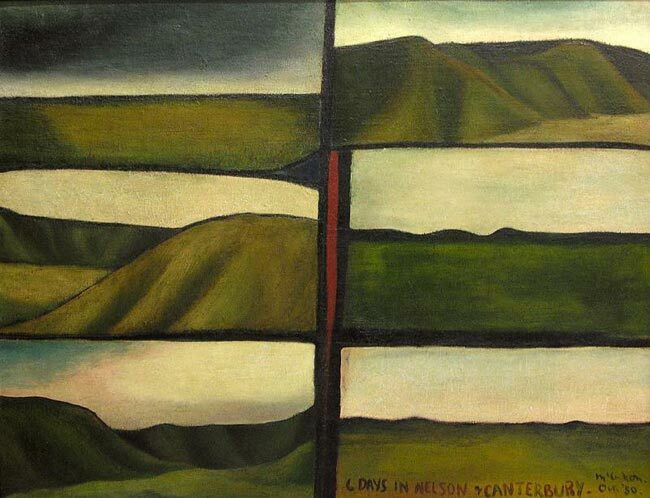 Colin McCahon: Six days in Nelson and Canterbury, 1950. Oil on canvas. Auckland Art Gallery Toi o Tāmaki. This intense, early landscape painting by New Zealand artist Colin McCahon compliments my previous post about McCahon’s later text paintings. 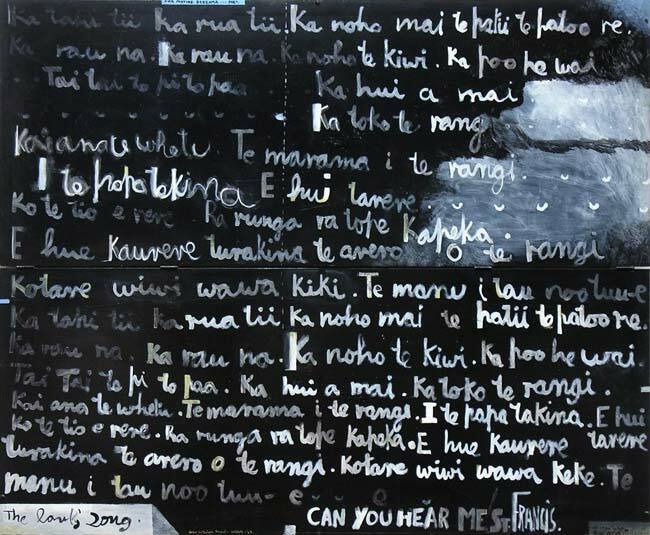 McCahon divides the space in this painting according to at least three different conceptual models: spiritually, based on the Biblical six days of creation; phenomenologically, based on his snapshot visual observations of the New Zealand countryside as he traveled it by bicycle; and pictorially, puncturing the painting’s surface with the spaces of six different landscape views. Below are several different commentaries that each shed light on this remarkable painting straddling the conceptual border lands between representation and abstraction, symbol and sensation, theology and phenomenology, memory and perception. “This painting I never explain but am often asked to. To me it explains itself. It was, I suppose, reconciling gains and losses, stating differences, hills and horizons. Simple. A bit of blood shed in the middle.” Colin McCahon is an outstanding figure in New Zealand art of the twentieth century. He was a great painter and a profound thinker as well as a teacher, critic and curator for ten years at this Gallery. In the 1940s the hills of Nelson and Canterbury were a familiar environment for McCahon, travelling to and from fruit-picking work. The fragmentary landscapes suggest glimpses flashing past the window of a bus or train, essentially similar, yet with varying moods. In response to a comment that New Zealand’s hills were monotonous, McCahon replied, “Monotonous yes, but with a cumulative grandeur, like Bach.” The “six days” in the title echoes the Old Testament six days of creation, before the arrival of humanity. McCahon extracts an austere beauty from these low hills, and at the centre of the painting he places water and the “bit of blood” spilt – symbols of grace and redemption. A beautiful, contemplative work, and one of the outstanding achievements of his early career, this is an example of McCahon’s intense exploration of landscape as metaphor for the human condition, for the journey of life. Source: Six days in Nelson and Canterbury: Colin McCahon, 1950. In the Christchurch years (1948-52) McCahon continued with the mixture of biblical narratives and landscape paintings he had practised in Nelson. Six days in Nelson and Canterbury (1950) is one of the best-known works of this period, nominally a landscape painting but with religious connotations deriving from the Genesis-reference of its title, while the streak of blood-red at the centre of the image alludes to sacrifice and redemption. Source: McCahon 1953-60: Before Titirangi. The life story encapsulated in that remark sums up a saga of genuine hardship and punishing resistance to his ideas. It’s a time-honored avant-garde script, but McCahon lived it: When he painted Six days in Nelson and Canterbury, 1950, he had just journeyed several hundred miles on a bicycle looking for seasonal work in the fields; his first job at the Auckland City Art Gallery was as a janitor. The irony of his experience lay in his resolute pursuit of an unprivate painter’s idiom that could communicate in society as widely and immediately as possible. Any aesthetic nicety that stood in the way of this goal he sacrificed as an impediment and distraction. Source: Spreading the word: Colin McCahon.